Available in feminized seed form, Double Glock is a true, 100% pedigree Indica Marijuana strain used genetic base heralds from the remote Afghanistan valley’s. As with all Indica, and particularly the Afghani varieties, Ripper Seeds Double Glock grows into a bush structure, remaining short and squat with strong branches produced close together. As you would expect from any 100% pure strain, there are no pheno variations, making Double Glock a great to strain to master and coax the very best from. For the best returns per individual plant, a longer growing time than some Indica strains is required, as Ripper Seeds Double Glock does not stretch a great deal in flowering, preferring to use its energy to produce thick forming flowers. A great strain for beginners and professionals alike, as it can withstand a high nutrient level, should any overfeeding mistakes occur. As with most of the Indica Marijuana Seeds, once flowering commences, maturing is around 8/9 weeks, with almost all being mature together due to the uniform stability of the strain. Production figures per square meter are unavailable at present and will be updated as we receive and read more reviews. Once dried and correctly cured, Ripper Seeds Double Glock is a highly powerful Indica Medical Marijuana strain, perfect for evening use and people suffering from stress and insomnia. Often prescribed for people who find it difficult to relax, Double Glock is an extreme sedative and make make the user feel couch-locked and sleepy, a powerful strain of pure Indica Marijuana. 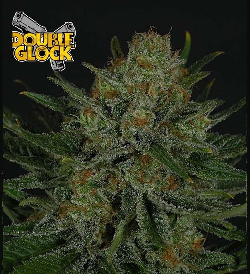 Ripper Seeds Double Glock Marijuana Seeds are available to buy online. Developed in mainland Spain, we here at VegPage are proud to promote the complete collection of all Ripper Seeds, including all the latest new Marijuana Seeds for 2013. Available as Single Seeds, or as Feminized Ripper Seeds Double Glock 3 Seeds, or 5 Seed packets, and with free Marijuana Seeds with every order. Click below for the cheapest priced Ripper Seeds Double Glock available. Discover how many Free Marijuana Seeds you will receive with your next order.